What do you think are the symptoms of Poor Time Management? Time management is a challenge for almost every individual. Executives have been found to be complaining more about the scarcity of time. The advent of 24/7 communications, increasing sophistication, intense rivalry, and financial insecurities have complicated the situation for the executives. Overloaded executives are struggling to allocate sufficient time to focus on strategic priorities and lead new initiatives. Time management is much more than an individual’s predicament. Its roots can be traced deeply entrenched in organizational structures, values, and beliefs. Leaders who are determined to tackle this issue need to deal with it institutionally. A 2011 global survey by McKinsey & Company asked 1374 executives (general manager or above level from a broad range of industries) about their time allocation habits. The results revealed a mere 9% of the respondents who were “satisfied” with their time allocation abilities. The executives falling under this group are office centered; prefer utilizing most of their time using asynchronous messaging—email, voice mail, phone etc. 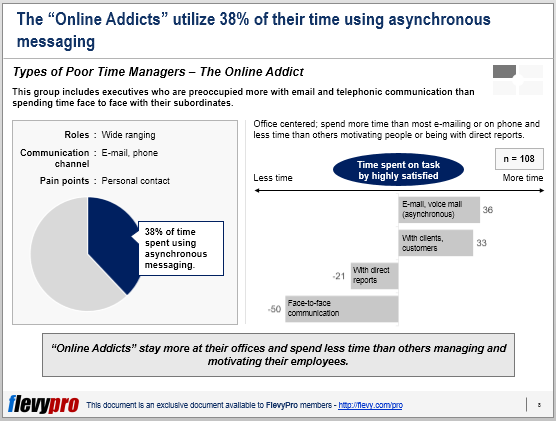 The “Online Addicts” spend less time meeting, managing, and motivating their direct reports. The executives within the “Cheerleader” group include those who spend more time meeting their direct reports face to face, however, their issue is spending limited time interacting with external customers. They are less likely than other groups to use email or communicate through telephone. Cheerleaders are employee focused, but less so towards the customer. The “Networker” comprises executives in the CEO or director positions who spend most of their time outside meeting customers personally or telephonically. The issue with “Networkers” is that they assign limited time deliberating, setting direction or devising strategy, and meeting their subordinates in person. “Networkers” are customer focused but lack in terms of devising long-term strategy and engaging their direct reports. The executives within this category utilize most of their time alone. They tend to micromanage things, and most of their spend time is spent dealing with emergencies through email or phone. The Micromanagers are operations centric, but are less oriented towards contemplating, setting direction, and meeting people in person. Abundance of large-scale projects and time constraints result in an initial overload for most executives that can lead to failed initiatives and missed opportunities. 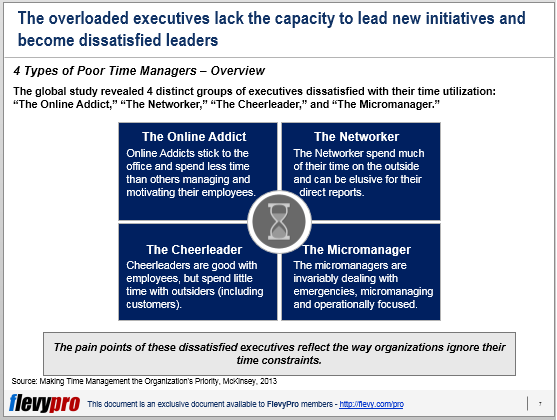 Dissatisfied executives—from the “Online Addict” and “Micromanager” groups—fail to dedicate the required time and energy to engage and motivate their teams that propel successful projects. Thus the organizations face “change fatigue” and lack the vigor to execute important engagements. Typically, there are rare chances of availability of proper time management guidelines for new executives across most organizations. This results in inappropriate allocation of their time on insignificant tasks and discounting strategic priorities. For instance, executives from the “Cheerleader” and “Networker” groups get occupied in tasks that they believe are critical, most of their time—i.e., the Networker is usually busy in meeting external stakeholders, while cheerleaders keep meeting and motivating their subordinates—but they fail to assign adequate time to other important undertakings —such as thinking, planning, and strategizing their long-term objectives. Interested in gaining more understanding on the types and symptoms of Poor Time Management? You can learn more and download an editable PowerPoint about the Symptoms of Poor Time Management here on the Flevy documents marketplace.